What does AACPMAS stand for? AACPMAS stands for "American Association of Colleges of Podiatric Medicine Application Service"
How to abbreviate "American Association of Colleges of Podiatric Medicine Application Service"? What is the meaning of AACPMAS abbreviation? 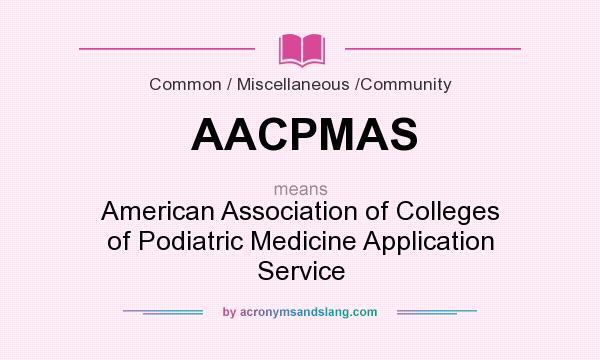 The meaning of AACPMAS abbreviation is "American Association of Colleges of Podiatric Medicine Application Service"
AACPMAS as abbreviation means "American Association of Colleges of Podiatric Medicine Application Service"